Hack 1: Have you ever made slow cooker chicken that needed to be shredded? Have you ever spent the tedious time to shred it with a fork? Yeah takes FOREVER! Hack: put the chicken in a mixing bowl and use a hand mixer to shred. Takes less than 30 seconds! Perfectly shredded chicken. We use this hack at least once a week. Hack 2: This seems like a no brainer, but lay your clothes out the night before. No matter if its gym clothes or work clothes. It makes your mornings go so much easier and you are probably more alert and happy picking out your clothes than you would be in the morning. Hack 3: Trash all over your car? Use one of these plastic cereal containers and use a plastic grocery bag inside. Easy car trashcan that won’t spill all over. Hack 4: Always needing a phone charger on your couch? This one is courtesy of my brother-in-law. Run an extension cord with your phone charger under your couch and up through the cushion to have a charger right where you sit! Life changing. Hack 5: I’ve mentioned smoothie bags before. But want to have a smoothie daily and not have the time to throw it together? Make smoothie bags once a week and stick them in the freezer. Put all the fruit ingredients together and pop in a blender with your liquid and veggie of choice! Blend and serve. Hack 6: Gym shoes smelling kind of gross? Put a tea bag in them(dry) overnight. They will smell amazing in the morning! Hack 7: Does your phone charge super slow? Put it on airplane mode while charging and it will charge faster. Hack 8: Do you get brain freeze when you eat or drink something super cold? Stick your tongue on the roof of your mouth for a few seconds and it will go away! Hack 9: Have a hard time seeing t-shirts in a dresser drawer? Try rolling them instead of folding them for more room and to see each one better without having to dig and unfold everything. Hack 10: Ever hit send on an email too fast? Ever send one and realize you have something misspelled? Write your email first THEN type the recipient email in. This will prevent you from sending too soon. Also, if you use Gmail, you can turn on the Undo Send feature to allow you to unsend an email right after you click send. 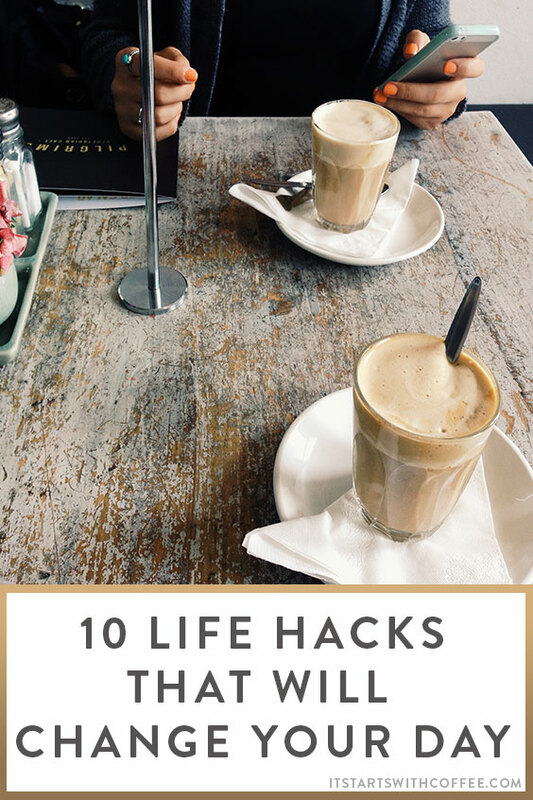 There you have it 10 life hacks that will change your day. I would love to know one that you would add to this list! This seems like a no brainer, but lay your clothes out the night before. No matter if its gym clothes or work clothes. It makes your mornings go so much easier and you are probably more alert and happy picking out your clothes than you would be in the morning. Okay, so I really like all of these tips (and definitely plan to implement the smoothie bags and the car trash can), but I have to say my mind was slightly blown by the first tip — the shredded chicken. I’d never thought of doing that, but I am ONLY doing that from now on! Haha 🙂 Loving this blog…and the coffee sentiment. Everything good starts with coffee. I’ll have to try the tea bag thing. That sounds interesting! Loved reading these hacks. In marketing, we are constantly on our phones so putting it on airplane mode is essential for us when we’re at events, etc! Great post! Why have I never thought about shredding chicken with a mixer. This is seriously genius. Great hacks here! The email one will prove to be especially useful for me I am sure. Cheers! I love all these! But number one is my favorite! I always shred my chicken with our KitchenAid mixer! Such a time saver! Neely – I love these! One is my favorite. I am always sitting there killing myself shredding that darn chicken. I can’t wait to try that. Oh, and I’m going to share this on my Facebook page later in the week. Thanks for the tips! Hack #1 was the most life-changing hack for me once I started doing it! It makes shredding chicken so easy. 🙂 I didn’t know about the tea bags in the shoes. That’s really cool! I already do the email hack of typing first and adding recipients after I proofread it. But I didn’t know you could turn on Undo Send. And I do the brain freeze one. The shredding chicken one is genius! I can’t wait to try it. All of these are helpful, Neely, but # 10 is a great addition for me! As an author and an editor, I cringe triple time when I’ve sent an email with a typo in it. Employing this device today! Awesome suggestions, I will have to try #1 this week! Can’t believe I haven’t thought of that before! Cute post! I love to cook so I have a hard time with slow cookers – my mother in law is trying to convert me. lol — I totally use the couch charger hack & need to adopt the car clutter hack. I’ve started packing my purse the night before, so that way in the mornings I’m not scrambling for my keys and wallet. Such a time saver and definitely leaves me less stressed. Loving the plastic container idea for the car! I REALLY need to implement that! If I’m going to be running around for a long period of time, I switch my iPhone to the battery saver mode! It definitely helps it last a little longer until I’m able to plug in. Helpful list! I need to try the tongue on the roof for brain freeze. So clever! Great life hacks!! I have def done some of these before but some I have not. I will def be keeping these in mind, especially the airplane mode for charging my phone faster. I already do the smoothie thing – except I put them in my smoothie cup and keep them in the fridge. It’s such a time saver in the morning I also pack my lunch the night before and just have to throw it in my bag in the morning. So much less stressful!! I’m excited to try the tea bag thing. I have not heard of using a tea bag to deodorize shoes… May have to try that! For me, a hack to feel instant relief in my home is to make my bed. Suddenly it seems like my home is more put together when I get done. Ooo such great tips! I love the first one with shredding chicken. Definitely a timesaver! I absolutely love life hacks! Anything to save time is a great tool! Wow! Shredding chicken with the hand mixer is a game changer..I never thought about that thank you! I’m going to try the tea bags in my gym bag. My workout clothes seem to have a permanent stink even after they’ve been washed for just being sweat in so many times. Thanks for the tip! Putting together smoothie bags is a life saver for me! I do it all the time. Great life hacks, some of them are really useful for me! Thanks for sharing! Always can use some new life hacks! Love the phone charger in the couch one. Definitely going to do that! Thanks for sharing! I really need to start laying clothes out the night before! These are so easy and so simple! Love the one about the smoothie bags! I am trying to drink more smoothies for breakfast, and this would ensure that I did since it is such an easy thing to do! I use hack #10 ALLLL the time haha. Life saving. I can’t handle hack #4 though – I need (and my boyfriend needs) to try this!! Great tips! I do #1 ALL the time — it’s such a time saver and keeps the chicken nice and juicy! I love a good hack! I’m so made I hadn’t thought to do the first one. My life will never be the same when it comes to shredding chicken going forward. I can’t wait to implement the charger through the couch as well. Mind blown, lol!! Awesome hacks, girl! I do the gym clothes one all the time! I had never heard of the unsend feature with Gmail before. GENIUS! Also, I do the shredded chicken hack ALL the time. It’s such a life saver! I’m going to have to check out Undo Send. I’ve unfortunately sent emails before I was supposed to one too many times. Love these! I’ve been all about hack 10 since I accidentally sent an email to the wrong person and was mortified! Great hacks! I need to put my ipad on airplane mode and see if that helps speed up the charging. Yes! I have been using the stand mixer hack forever and it is a life changer! I love your tip about the car trash can, as a mom to four little ones that one is definitely something I need! These are some super great hacks that I never even thought of. Thanks for the great ideas! What a great hacks! These are really useful. I’m really glad that you shared hacks, this will make our lives easier. That’s a great list! As a food blogger, I’m particularly fond of the shredded chicken with hand mixer hack. Thanks! These are brilliant!! I love the one about shredding chicken and the charger through the cushion! That’s such an awesome idea, can’t believe I never thought of that haha. I currently have a charger next to my sofa, but only one person can use it at a time and only when you’re sitting on the end haha. I love you B-I-L’s idea for the phone charger and I am very intrigued by the tea bag in your shoes! I definitely need to try that! The hand mixer to chicken hack is so smart…it seriously saves me SO much time! And laying clothes out too…I do that all the time because it’s just so much simpler than having to THINK at 6 am! Ha! I had NO IDEA gmail had an undo send button! Thats so FREAKIN COOL!! I’m not usually one to send emails too early, but I know this would come in handy in the future at least once. SOOO Useful yet must try! These are so great! I’m definitely bookmarking this! I definitely need to try 6 and 7! And 10 is a life-saver! Great post! All of a sudden I feel like my life has changed forever. Love the charger hack especially, considering my battery runs low like there’s no tomorrow!